Ankle-length skirt or 'maxi,' a term introduced in the late 1960s. A skirt is a tube or cone-shaped garment that hangs from the waist or hips and covers all or part of the legs. A maxi skirt is a skirt that drapes to ankle length. Maxi skirts can be either flowing or curve-hugging. Either way, they are a timeless garment that is so classic that it most likely will never become outdated. Maxi skirts are a wardrobe staple for most of women during the spring and summer months of the year or in warm climate locations. They can also be worn during the fall and winter as well. This makes them versatile and appropriate for most wardrobes. In addition to be versatile in regard to the time of year, they are easy to style with many other fashion products and they are generally a very comfortable skirt style. The hemline of skirts can vary from micro (very short) to floor-length and can vary according to cultural conceptions of modesty and aesthetics as well as the wearer's personal taste, which can be influenced by such factors as fashion, sense of personal style and social context. 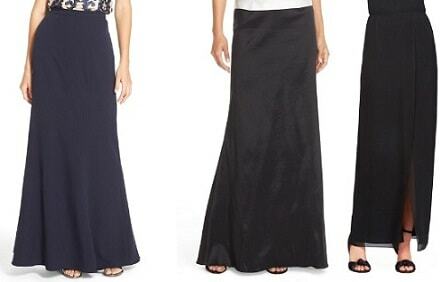 Apparel Search truly believes that the maxi length skirt has an important role in every woman's closet. By the way, this type of skirt looks good no matter the women’s height. The maxi skirt style comes in many different textile fibers, fabric construction, colors, and sizes. If you are looking for a classic skirt, you will find many options with the maxi style. Learn about short skirts & denim skirts.